I bet everyone know that I love Blusher!! 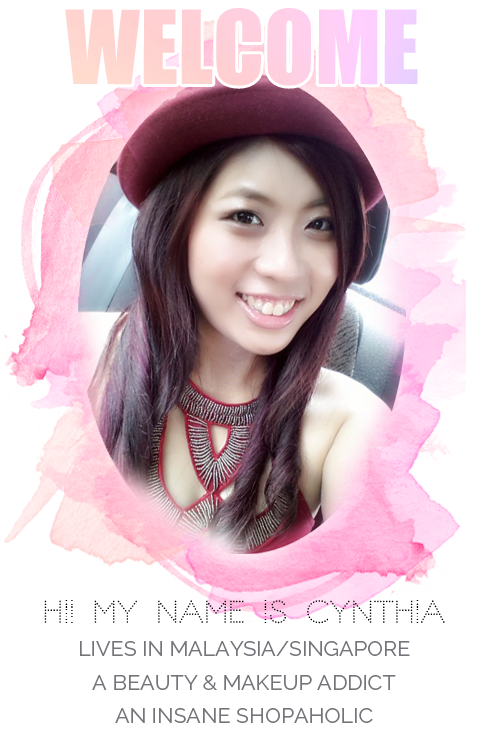 ♥♥ If you know not, head on to read my Blush Fiend post. And when you own a blusher, you need a makeup brush (practially blush brush)! Of course, if you're using cream or liquid blushers you may not need them. But, it does makes a big different using them with brushes! I dislike using finger because I find them really unhygenic. 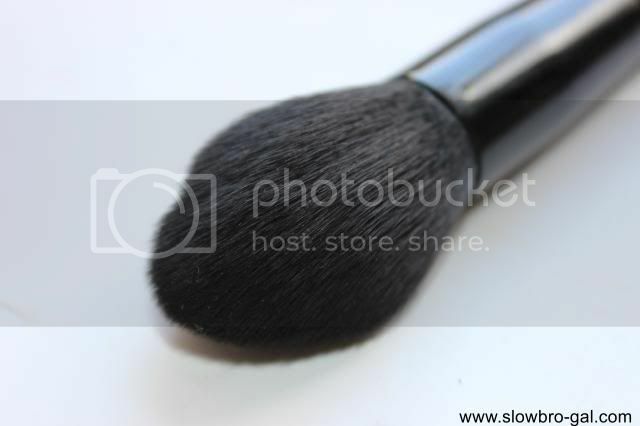 So today I gonna share with you my favorite blush brush! And if you're a makeup beginner, this post is for you. I got a couple of questions from my readers asking me which are my favorite makeup brushes. 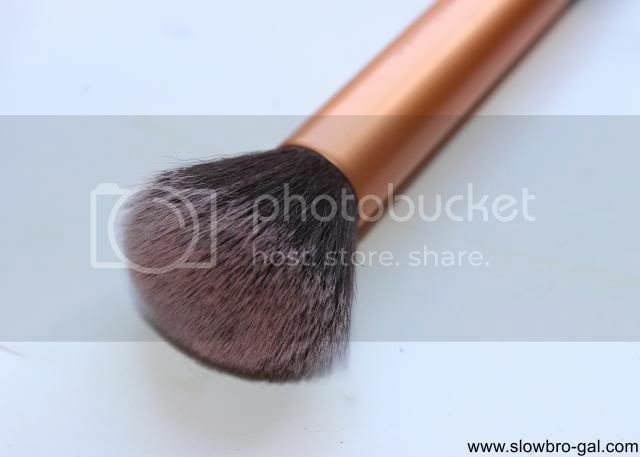 I decided to share and split into different type of brushes and for today - blush brush. Bottom to Top: Ecotools, ELF, Loveybelle and Real Techniques. 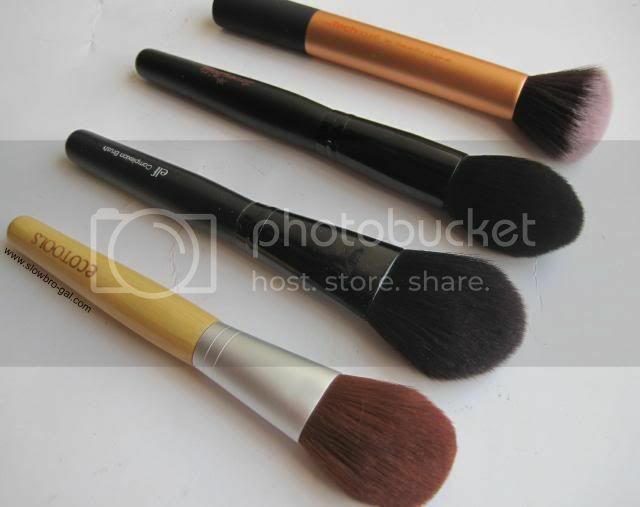 In no particular order, these are my top favorite blush brushes! Some of these brushes has been with me ever since I started this blog when I was a student then. Most of them are quite affordable, so if you're in budget - read on! I can't imagine this brush has been with me for a good 3 years and still counting! Despite excessive amount of washing and abusing using it, it's still very good in condition. Check out my review on it here. Although it is synthetic brush, but it picks up a good amount of blush and it's super soft and smooth that I just couldn't rave enough. If you're looking for a good blush brush, this is the top in the list that I would recommend to you. It's pretty affordable and easily available in most drugstores. This brush is totally out of my expectation when I bought it. 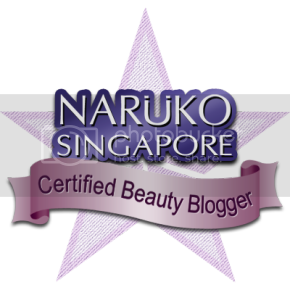 It may look huge for a blush brush but it works very well - especially for Guerlain Meteorites. Though it's not as dense as the other brushes but its still very soft! 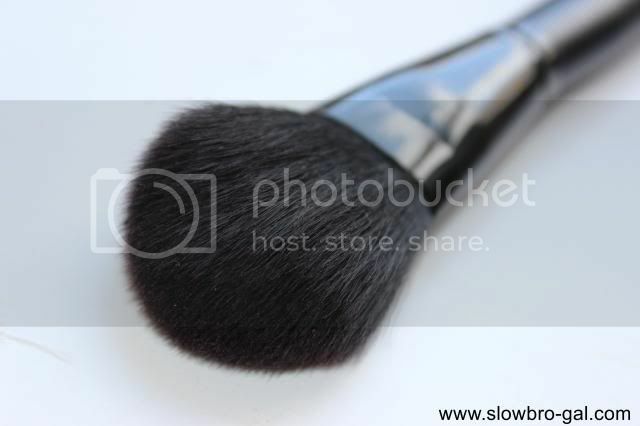 You can use for several purposes but I like it as my blush brush. I've been using this about 3 years and it's still working very well with no shedding (after wash). The only cons is that the plastic handle isn't that strong that the middle part might detached from the handle. :( Still, for US$3 I can't complain more. I've featured this brush a few times in my Instagram. Tapered brush is good for contouring purposes due to their dome shape that give a precise shading. 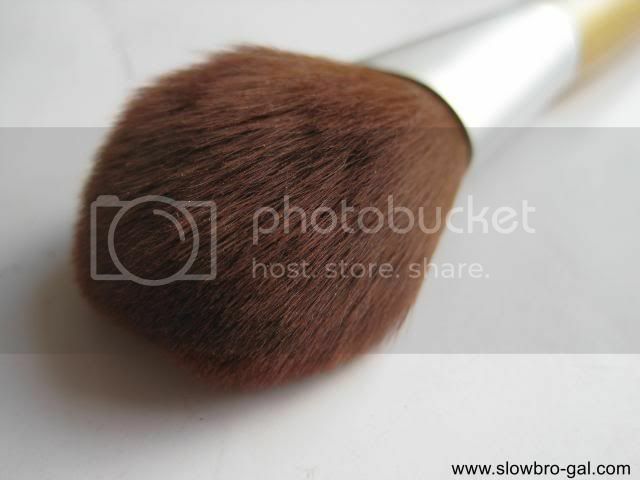 However, I find this brush is better for blush/highlighting than contouring. I'll share my contour brush next time. The brush is made of natural hair and it is very dense that it picks up a lot of products. So I usually use this for my Japanese products - which tends to be a bit sheer. And for Japanese, they usually apply their blusher right on top of the apple cheek to look more kawaii. =p This tapered brush serve dvery well for that purpose. I'd mentioned this buffing brush (from core-collection) in my Monthly Favorite last year and yes, it's amazing! Real Techniques brushes are commonly well-known for their quality at affordable prices. This Buffing Brush is soft, dense and sturdy! Everytime I use this, its like ping pong ball bouncing against my skin. I use it mostly for blush but it can be used as bronzer and also foundation. A multi-tasker brush indeed. Share with me what's your favorite blush brush! ELF one USD3... maybe I should check out that one soon.. after 3 yrs still looking good ah! Now my wishlist Lunasol blusher brush and MUFE ones... can someone send a Santa ? I have my fair share of affordable blush brush and am still using till now. I really like the ecotools because it's soft and nice though I find it a touch too big, prefer a slightly smaller brush head these days. Hands down on Real Techniques! It's the best set of brushes I've ever purchased! Great for beginners too! I have quite a few different styles of the e.l.f. brushes and yes, they do get loose and come apart at the middle. I fixed that problem by pulling it apart and using E6000 glue to make it permanently stick together. Nice post! Your blush brush are very nice. I usually use only one blush brush. I absolutely love my RT brushes, and I've hoarded them because they are way too cheap here in the US, unlike in the UK before. You definitely are a blush fiend ahahah love it! amazing post. I need this, because I still have a lot to learn about brushes and makeup. hope you are starting the week greatly. I love Elf blush. Even when I have to buy it online since they didn't sell those here. Thank you for sharing this. I will try real technique brush later. I have been eyeing on them. I want to do this post too! <3 love all of your brushes especially the buffing brush. Now i wanna try it for cream blush and also bronzer. I normally use it for foundation, never tried on blush or bronzer. will do so soon. However, after all, just stick Slaughter cents instruments used, even if it is Swire instruments used, but it bore a striking resemblance magic level Bloody confrontations Fork still accounted for under the wind, and the repair of blood the north face outlet demon enough to have built the base three, deep spiritual north face outlet online power of simply can not north face outlet online be north face factory outlet compared, although extremely Ice gas to help, but under the blow, or accounted for under the wind. though you have a very ice gas to help, north face factory outlet but alone you this repair, I want to deal with, next life. To go. Blood demon soon Lihou, above Liangbing big bloody carnage Fork will put the wind up all three meters long turned into a kill cents went directly to the stick. Dangdang. Bloody Slaughter cents stick with Liangbing Fork suddenly collided with spiritual power that I saw a the north face outlet white light above the carnage and kill Fork stick cents above the light touch of the moment will dim.